The GH3 is the first Micro 4/3 camera to feature wi-fi connectivity, and it’s the first camera I’ve used to have these features, though they are becoming more and more common. Due to the very nice added functionality wi-fi can provide, I expect that it will be included in some form on most advanced cameras (and maybe all cameras) in the very near future. The wi-fi capabilities on the GH3 allow you to do a whole host of very cool stuff. You can tether the camera to a computer while you shoot, which will automatically transfer your images to your computer, smartphone or tablet. The GH3 will also allow you to connect after the fact and send specific images to a computer, smartphone or tablet for quick editing or e-mailing. You can also send images to a DNLA enabled television without any cords. And, the one that allows for the most creative opportunities, you can connect to a smartphone or tablet and have full remote control of the camera. It’s worth noting that none of the features that connect to your tablet or smartphone require you to have a wi-fi network in range. The GH3 creates it’s own wi-fi network, so you can use these features in the middle of nowhere if you like. You just need to have the Lumix applications on your computer or mobile device (Android and iOS are supported). Setting up the connection can take a little bit of time (I had to re-try the connection from the camera to my iPhone 5 two or three times before it took), but it works as advertised. While the image transfer features are pretty self explanatory, I’m going to delve in a little deeper on the remote control. After connecting your camera to say, your smartphone, you open up the Lumix Link app, and you are presented with a full control interface for the camera. 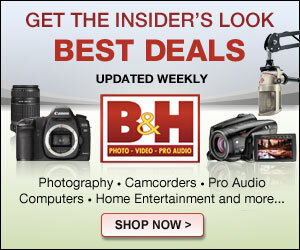 If you are using a lens that has power zoom, you can even zoom the lens remotely. 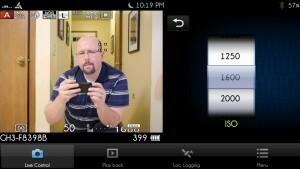 On the left side of the app, the camera viewfinder is replicated, it’s truly a remote monitor of the viewfinder display. 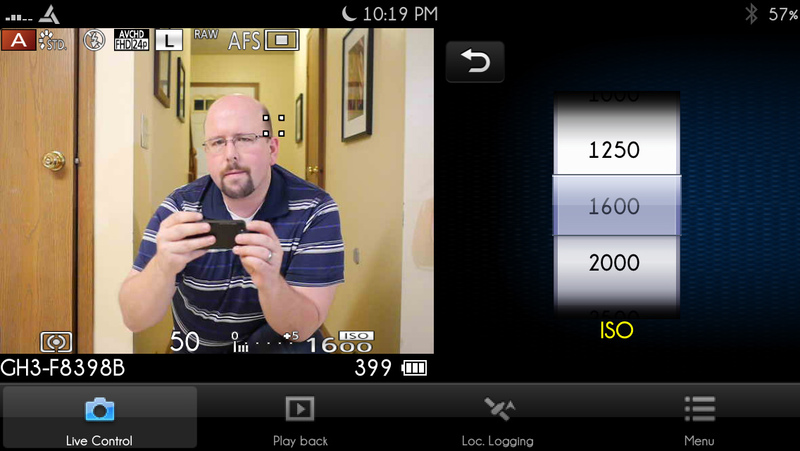 On the right side is a general camera interface, which then allows for parameters to be changed individually (see the shot above showing ISO selection). Focus point can be changed the same way you would on the rear screen – just touch where you want the focus point to be. The GH3 capturing an image remotely. When you want to shoot, you simply press the shutter button in the app, and the camera focuses and takes the picture. This worked perfectly, as you can see in the picture to the left, where I took a picture with the app, of the phone. Note that the ‘please wait’ that shows when you’re shooting the image disappears quickly as the camera resumes sending the live feed to the device. What’s so great about this feature is that it gives functionality for free to the photographer that used to require very expensive specialized gear to accomplish, and even then, usually without an actual view of what the camera was recording. (The photographer simply waited for what they thought was the right moment and mashed the remote trigger). This opens up a whole new world of remote shooting to get shots you simply wouldn’t be able to before. 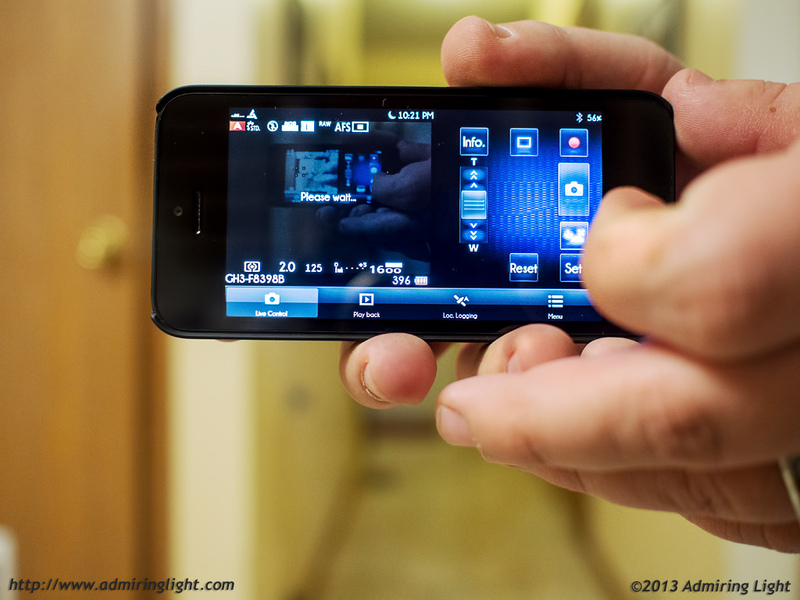 The remote shooting application also allows for the ability to attach GPS data from your phone to images and to review images you’ve previously taken as if you were looking at the back of the LCD. I can’t wait for this to be widespread in all cameras. The GH3 has so much packed into it, that unfortunately, I didn’t get to test it all out. However, there are some additional cool features that I was able to try out. The GH3 has the ability to do multiple exposures in camera. While many cameras have this feature (my original Olympus E-P1 had it), the GH3 is the first that I’ve encountered that combines the multiple exposures into a RAW file. This can make for lower noise images if you’re on a tripod, as it will average noise out at higher ISOs, and it allows you to make some pretty creative compositions as well, while retaining the advantages of RAW shooting. While the stacking to reduce noise is of limited use, simply because if you’re on a tripod anyway you might as well just use a longer exposure, having RAW capability with multiple exposures is a really nice thing to have. The GH3 has a built-in HDR mode that unfortunately does require you to use JPEG. The camera also has a built-in intervalometer for time lapse shooting. Some reports have shown this feature to be inexpertly implemented, with some odd timing issues, but Panasonic has promised a fix in a soon-to-be-released firmware update.